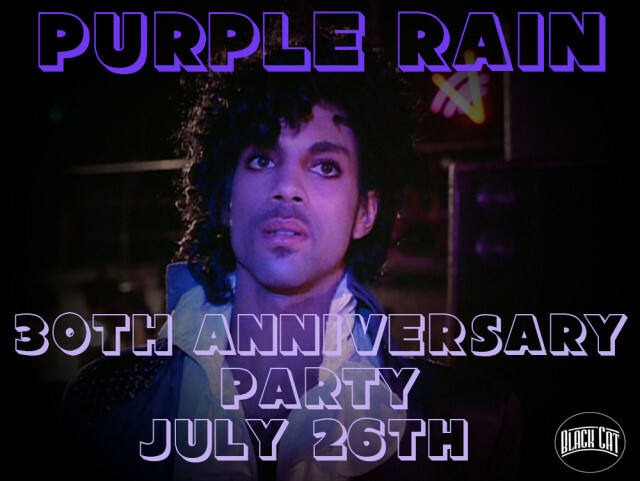 “On Saturday, July 26th, 2014, DJ Dredd will present a 30th Anniversary celebration of Prince’s seminal film and soundtrack, “Purple Rain” at the historic Black Cat nightclub in Washington, DC. The celebration, which takes place at the Black Cat nightclub, will feature a screening of “Purple Rain” at 9pm, followed immediately by a Prince themed dance party–featuring a marathon set of music, remixes, and videos. The event will also feature giveaways, signature themed drinks and a costume contest. The Black Cat nightclub is located at 1811 14th Street, Northwest. Advance tickets are available from Ticketfly.